FindItMore | The trends in the shape of rings may come and go, but Diamond will be there forever. It is the mark of excellence and supremacy. It is the best way to show that you love your bride to be the most in this world. It is why people choose diamond rings for their engagement or weddings. This year also, the trend of buying the diamond ring is in fashion. However, there are a few trends that change. This year you will see people are looking for a bit different diamond rings than usual. People are looking for the best diamond wedding rings design for 2019. Here are a few diamond rings trends that you will see are at a rise this year. Choose any of these designs to stay up to date. In the recent past, the couples have been choosing the colored stones for their wedding rings. Many people this year will leave the tradition of buying the traditional diamond and go for a colored diamond. Not many stones are durable as a diamond. Choosing the colored diamond as center stone for the ring is going to last forever. If you are looking for long-term durability then choosing the colored diamond ring can be the best choice. Like many people this year, you can also say no to the classic diamond ring and choose the colored diamonds. Another trend that you will see in fashion this year is the double band rings. Stacking the diamond on the double band make sit fancy and unique. It is a pretty good alternative for two rings. Many brides, who want two rings, choose the double band rings. It is not only a cheap solution but also trendy. This diamond ring shows the trend that is becoming mainstream. These rings with the three stone shapes are also in trend with the center one as a colored diamond or any other gemstone. This year you will see that the Halo rings will use the varying size of diamonds and shapes. You will see a different symmetry of small diamonds stacked up in a single ring. These halo rings are a norm for engagement. These rings are utterly glamorous and crafted with Baguettes and round diamonds. Think about a ring that will last the rest of your life. The trends of getting the thick band diamond ring never change. These solitaire rings with think bands and a large diamond in the middle are very much in fashion this year too. This year many brides are looking to get the ring that looks bigger. These are the brides who want to show the people how committed they are for their relationship. The think band signifies a strong rigid and a thick bond. 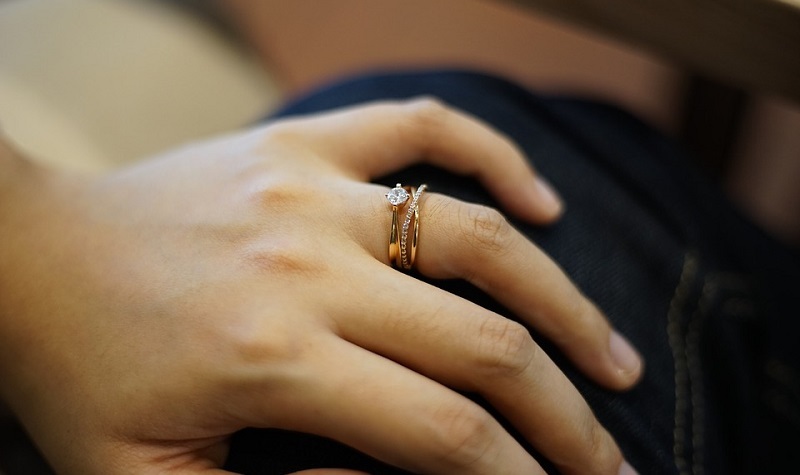 Topping the think band with a different diamond shape will add a spark to it. This year the brides are also looking for the old fashioned Yellow gold and adding their favorite diamond to it. Unlike the traditional yellow gold ring, you will see that the brides are adding pear-shaped, and oval shaped diamonds to the yellow gold. Besides the traditional styles which will be in fashion this year, you will see many brides opting for custom rings. These diamond studded rings have a unique shape. The custom rings will never get out of fashion. Many brides have their preferences, so they like to have a unique design. They like the turns and twists of the gold upon which you will see a large diamond. It is why you will also see that this year; many brides are still looking for something out of the ordinary. You can also get a new design for your wedding ring by ordering custom rings. A round diamond is a classic setting for the wedding ring, but this year you might also see the change in this trend. The brides are also looking for geometrically shaped diamonds. Stacking the gold with the octagon, hexagon or the triangle shaped diamonds is also a new trend this year. This year you will notice that many brides are looking for antiques. They like bringing the history back and adding that flair to their wedding. This year people are looking to get the accent diamonds and intricate engravings which are beyond the simple solitaire. These are the 2019 wedding or engagement Diamond Rings Trends this year. Choose any of these styles and stay in fashion.